Back To School Flyer Template 3 It’s that time of year again! The school vacation is almost over and it’s time to get back to studying. This school themed flyer template is an excellent way to promote your “Back to School” or school uniform fancy dress event. The main title area of the design stands out on a chalk board backdrop and is surrounded by various classroom elements – such as a scissors, a triangle rule, chalk and pencils. There’ll be no doubt in anyone’s mind that your party event has a “Back to School” theme when they see the flyers you’ve made with this template. Simply open the template with Adobe Photoshop, edit your text and paste in your own stock photo or naughty schoolgirl. Within minutes your world-class flyer design will be ready to send to the printers! The school vacation is almost over and it’s time to get back to studying. This school themed flyer template is an excellent way to promote your “Back to School” or school uniform fancy dress event. 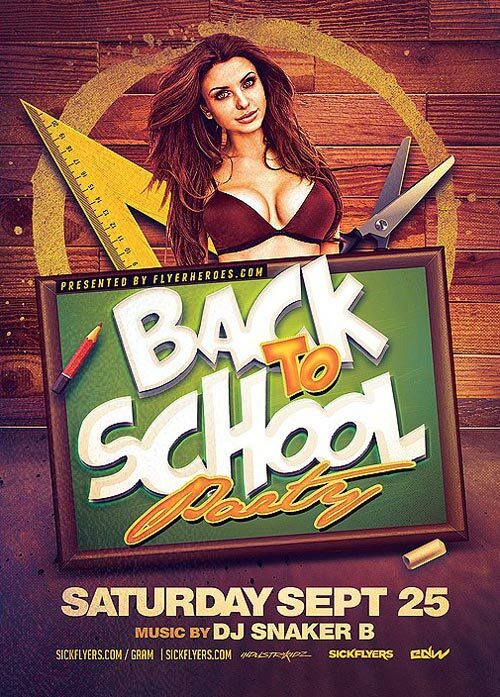 Back To School Party Flyer Template from FlyerHeroes are fully editable Photoshop PSDs. Once you have downloaded this template, using Adobe Photoshop CS4+ you can make use of this flyer design an unlimited number of times 100% royalty free. You are free to customize this design however you wish and use in both personal and commercial projects without ever crediting FlyerHeroes.